Exciting New Pieces, Exciting News!! Copper Rings, originally uploaded by antigenre. I’ve been meaning to make some more pieces for men but have only now gotten around to it. 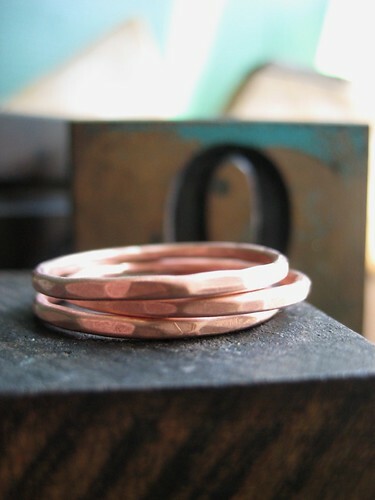 This is a set of three hammered rings made of heavy 12-gauge copper wire. Check in with AntiGenre on Etsy, because these and some other new items will be up soon. In other news, thanks to all my wonderful customers, my business has been steadily growing, and I have just recently been fortunate enough to be able to cut back on my hours at my day job. 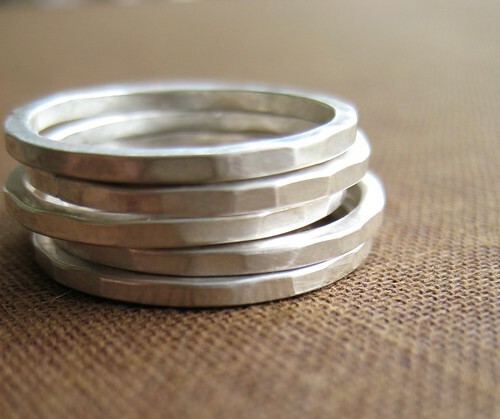 I’ll be spending a lot more time at my work bench and will be able to concentrate more fully on my jewelry. Hooray!! I’m really excited about this, and to celebrate, I’ll be having a launch sale in just a few days – I’ll post the deets as soon as I have them!